Eating and blogging my way around San Francisco and beyond. 18 year veteran of The City with long food history. Usually I prefer to not hit hot new restaurants near their openings. Sometimes it is good for them to get their s**t together for a few months and work out all the kinks. Sure, some of them do hit the ground running and are spectacular, but that is rare. I have found it helps to wait it out a bit as you never know, in those few months I'm waiting, they might close and I can save myself a trip. I recently met the SO at their work one Friday evening and we were like, let's do something we haven't done in ages and randomly choose a spot downtown to show up and dine at on a weekday. I am like where? They said there was some place about a block away they had been to a week ago with co-workers we could try. Sure, let's do it! As we rounded the corner I was, you mean International Smoke? You've heard of it? Yes, they opened about a month or so ago to much fanfare. It is Michael Minna's collaboration with Ayesha Curry. Who? Never mind. It is a super new hot spot and since it is 7pm on a Friday night, we are not going to be able to get in there without a reservation. Well, let's try anyway. That is how I remember the conversation going. I had read up on the place since it was first announced and new it would be focusing on smoked meats, thus the name. Perusing the menu there are a variety of meats from the apps to the entrees and include things like chicken, pork belly, tri-tip, ribs, fish, etc. Since they are supposed to be all about the meat I wanted to focus on it as much as possible. Seemed like a good idea to kick it off with something called Kalua "Instant Bacon." It is served with flair as they come to the table under a glass cloche that is filled with smoke. The food runner whips off the top and lets the smoked steam waft across the table. Seems mostly for show as we couldn't smell any smoke, it dissipated quickly and I can't say it really added anything to the dish. You get two steamed buns filled with a Hawaiian teriyaki seasoned strip of pork belly topped with some pineapple salsa. These are gonna set you back a whopping $17 which is overpriced for not only what you get but how they taste. The buns were decently puffy, but instead of being kind of cloud like, they were a tad stickier than they probably should have been. Plus, they are the same size as ones you might get from The Chairman, just with less meat and filling. The salsa was just eh, I mean, at least you could taste the tiny bits of pineapple, if not much of anything else. My real issue here was the pork belly. It was the barest of strips and while the menu said teriyaki, the marinade on it was more on the fish sauce side of flavor which made it terribly off putting and an instant dislike for me. So besides being small and tasting weird they cost too much. That is like the triple play of a big NO in my book. I figured we couldn't move on quick enough from these as I really needed to get that taste out of my mouth. Smoked rib tip mac and cheese seemed like the perfect antidote. A little crockery of macaroni and cheese with a layer of barbecued and smoked rib tips, cornbread crumble and copious amounts of green onion. It is a decent sized serving and you can pretty well make this your dinner entree if you choose. The mac and cheese is of the super creamy version with a mix of yellow and white cheeses, almost like a bechamel sauce. Very rich and velvety for sure. There were also more rib tips on top than I would have expected. I'd say enough to make most of a sandwich with. Juicy shredded pieces of pork with lots of smoke and a slightly sweet and spicy barbecue sauce coating. In essence, the meat kind of balances out the richness of all that cream and cheese. The cornbread gets a little lost and I'm not the biggest fan of all those onion pieces on top, a bit of an overkill. Still, this was a dish we both enjoyed and it has all the comfort food hallmarks you would want. If mac and cheese weren't enough of a comfort food, for some reason I felt the need to give the RN74 prime burger and fries a shot. First off I should note, the pork belly on here turned out to be the exact same marinade ickiness they served in the Kalua bun. One bite and that weird flavor overwhelmed everything! Ugh. I couldn't pull it off fast enough. The difference between a bite with and without it was a world of better flavor. The burger was thick and juicy with more than enough cheese to get in every bite. The sauce was almost exactly like "that fast food place" which does special sauce, though I'm sure it was elevated and made by hand (wink, wink). While in size it isn't the biggest you might find in town, it is still a tasty version most people are going to enjoy. Might not be my first or second choice for a burger, but they did a good job. Before I get to the main entree, we did order up one of their sides that sounded quite tasty. 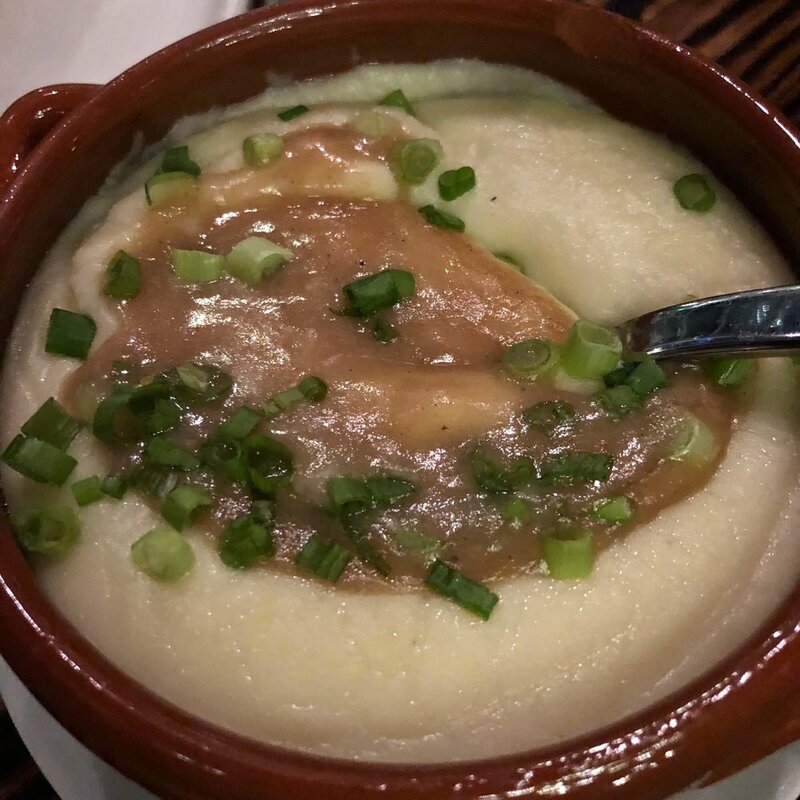 Whipped potatoes with duck fat gravy and more of those damn green onions. It is served in the same size crockery as the mac and cheese so there is plenty to go around. Props I can give this are it was buttery tasting and the potatoes were extremely smooth. However, I kind of like my potatoes chunky and thick and these were the exact opposite. If you like mega creamy then they are for you, but it seemed more like consomme than mashed potatoes. I know the menu said whipped, but even then I expected it all to be thicker. There also wasn't that much of the duck fat gravy. Plus it too was more soup than thick and it all kind of just swirled together. I'm sure these were over loaded with butter (okay with that) but then it was probably pressed through a sieve or something to get a silkiness chef's might like but really turns a comfort food staple like this into a soup. Ultimately these may come down to personal taste in how you like your potatoes and these were not really my forte texture wise. I feel if you are going to do smoked ribs and things you need a hearty thick side dish to hold up next to big meats. Which brings me to what was the main attraction, the smoked pork ribs. This is actually a whole rack and when I ordered the full size, I did so not really knowing what I was gonna get. You think, oh, high end place and prices, what is their idea of a full rack. Honestly, when it came to the table I was a bit surprised as it was a thick, full rack of pork ribs. And at the price point, considering other spots in town, I thought the cost was rather spot on. The meat was pretty much everything you hope for in ribs--juicy, meaty fall off the bone chunks of pork with a nice smoke that was flavorful yet not overwhelming. They also offer sauces of either Cuban mojo, Korean gochujang or American BBQ which you can get on the side or they will slobber it on the ribs themselves and fire crust it on. We got the American on the side as I prefer to get the full taste of the meat and just a little bit of dipping on the sauce. This one was like St. Louis meets Texas being spicy with a little bit of tomato and sugar sweetness. Not my fave, which is why I get these things on the side. One thing I will knock about the ribs, right before they come to the table they re-fire them on the grill to give a little extra char, which is great, however, here they sprinkle it in brown sugar before the fire which gives a little bit of a sweet crust to it. I found this totally unnecessary and kind of let the server know too. I think it is something they need to tell folks beforehand as I would have said don't do it. As a piece of smoked meat, it was an unneeded sweetness I could have done without. Sure, you can fleck it off, but that takes some of the nice char with it. Not a trade off I like to make. Overall though, the ribs were a winner on the plate and in my mouth and because we had over ordered, as usual, we had some leftovers to take home. P.S.--I was underwhelmed by the dessert offerings and didn't get anything. They need to work on those choices. Add your email address in the box to receive news and updates as I do have a goal to send a newsletter. It's good to have goals! We respect your privacy and emails are strictly for my use and will NEVER be shared with anyone. Feb 14 It's Valentine's Day....or did you forget? scroll through my flickr photo fun!